Sepideh Rahaa’ speech at Arkadia’s seminar: IS THE FINNISH ART FIELD DIVERSE, OPEN AND EQUAL? On 15.1.2019 Arkadia Society of Artists and Parliament Members organized a seminar with Globe Art Point, Culture for All and Centre for Cultural Policy Research Cupore, with the aim of raising debate on the conditions of cultural services and the possibilities of artwork for non-Finnish born artists and artists with disability. You can find all the information and program in Finnish and English here. The seminar was held in Finnish and interpreted simultaneously to English and Sign Language to the assistants. You can watch it on Arkadia Seura´s Facebook Page here. 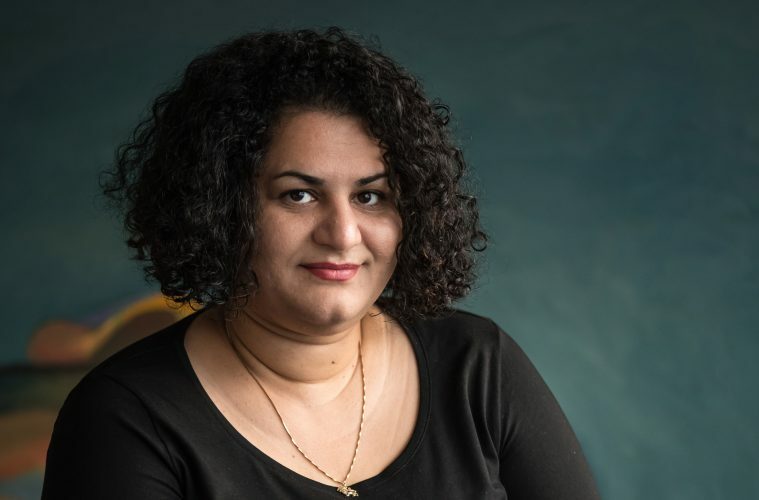 The visual artist – Researcher and doctoral candidate at Aalto University Sepideh Rahaa, participated in the Seminar with a speech and a presentation as an expert and as a board member of Globe Art Point. you can find more about her at our board page. Today I am honored to be here, especially since this is the first time I stand in a country’s parliament. Finnish society is a progressive society which enables us to be having this conversation, I am truly grateful for this opportunity. Finland is a country with a promising future, with an astonishing and progressive thinking younger generation. And with so many wonderful well-intentioned people who are working day and night to bring about change in our society. fsecThere are several reasons that many of us do not believe that the Finnish art scene is inclusive and diverse enough in comparison to the realities which we live in society. We do not see the diversity in action. We do not see it ‘enough’ on the walls of museums and galleries, theatres and in the municipalities’ major activities. We are all part of a big family, and it is a social responsibility of every one of us to assure the maintenance of democratic life, an inclusive art and culture for all and not only for the majority. That is why we are here today discussing equality which is foundational to democracy in the parliament as its Symbol. I want to emphasize here that when we discuss equity this word would need clarification as many people who hear it would not understand it to mean ‘fairness’! we cannot only imagine ourselves but we must shift our gaze outside the box, precisely because it allows us to consider ourselves not only as a single individual but as part of an ongoing historical movement. Some of us are more privileged not to face inequality in everyday life. Race, nationality, religion, gender and age among other factors play a significant role in our experience of inequality. I believe there are people in this room who do not see any or very few of those factors when they face themselves in the mirror. Privilege is invisible. It is indeed a luxury that some of us do not have to think about. That is how privilege works, it is invisible to those who have it. Privilege is when we make decisions that benefit enough people, but not all people. I would like to give you an example, please bear with me in imagining this scene: in July 2017 the last time I had to visit the migration office Migri, in Helsinki, the young woman behind the desk, clarified facts to me: First, my marriage to a Finnish citizen is not ‘fake’, second, I am a good citizen because I am a researcher and an artist who earns enough money, therefore I am worthy of being granted the next four years’ of permanent residency in Finland. I calmly listened to her, but what if I had none of those qualifications wouldn’t I be human enough to be worthy of it? Or last year, I was the only person from Aalto University’s team to be prevented from attending an artistic research conference at Tate Liverpool in UK, just because of the geography I come from! Years of effort in Finland and my permanent residency did not guarantee respect, equality or freedom of movement for me. In the last two-years of investigation, conversations and seminars organized by Globe Art Point in collaboration with artists and Finnish institutions resulted in a clearer understanding of certain issues, seen here illustrated in this mind map. There are several factors which create inequality in the Finnish art scene, some of them are drawn here. Evidently, language is the most common barrier for many artists and cultural workers to be able to carry out their practice or to be part of the art scene. It creates insufficiency and a lack of accessibility at all levels for most of the fields. It does not allow Non-Finnish and Swedish speaking artists to have the same access to opportunities and essential information. That is a privilege, a luxury that many of us do not have. Instead of the question: ‘Is the Finnish art field diverse, open and equal? I would like to invite us to think how can we create a more inclusive art and cultural scene? To do so we need to engage in equitable practices, it means that instead of fixing the differences we should fix the systematic obstacles, and that requires us to be more intentional. Instead of reaching for a homogenous society we need to recognize our differences as unique opportunities and not obstacles. We can be part of making change. We need to shift our gaze from majorities to so-called minorities the ones who are categorized as the other in the art scene and in society. We cannot erase history but we can amend it, by being more inclusive and diverse in all levels. It is not only about making policies but about exercising them, ‘Actions speak louder than words’! We will not have equity unless everyone can feel they are included feeling respected and accepted without judgement. Obviously, we cannot master inclusivity and equality overnight, it cannot be adequately achieved over a short period of time. It requires our collective determination and encouragement. We cannot change our present by taking an eraser and getting rid of the problems or the past. It is an amendment, something that says, “This is where we were, but this is where we are right now, that will help us understand a little bit about where we’re going”. The decisions we make today will change history and realities, for us and for our children to live a better, inclusive and diverse cultural life and to cultivate their imagination beyond that. Speech edited by Edwina Goldstone. Mind map done by Kemê Pellicer and updated by Sepideh Rahaa in 2019.